The Spanish department will debut a new five-year master’s degree program next semester, allowing students to earn degrees in both Spanish and foreign language education. The Spanish language program is looking to send more of its students back to grade school as foreign language teachers. The program will debut a new five-year master’s degree program next semester, allowing students to earn degrees in both Spanish and foreign language education. Spanish faculty said the program, which will feature two new courses taught entirely in Spanish, aims to train more foreign language educators to address a nationwide shortage of bilingual teachers. Starting in the spring, Spanish majors will be able to graduate in five years through the new combined bachelor’s and master’s degree program. The new major program will include upper-level courses in Studies in Latinx Cultural Production, which will examine how culture is reflected through art and literature, and Spanish Applied Linguistics, a class focused on the mechanics of teaching the Spanish language. María José De la Fuente, the director of the Spanish language program, said the new degree is an opportunity for students to fill the growing need for Spanish teachers around the country and, specifically, in D.C.
“Every single state in the U.S. reports that there is a shortage of Spanish teachers at every level of education and Spanish is growing exponentially,” de la Fuente said. About half of school districts in large cities either had a shortage of bilingual teachers in 2013 or will have a lack of those instructors by next year – at a time when the population of bilingual public school students is surging, according to a report by the Council of the Great City Schools. De la Fuente said the new courses and the new degree will hopefully encourage more students to teach grade school students and meet the growing demand for bilingual educators. “We are trying to move toward getting some students excited about being teachers, and teaching the language, and that’s why we are offering more variety of upper-level courses that are beyond learning the language,” she said. The new major will also include an additional service learning component that will give students one credit toward their degree for spending a semester tutoring or participating in outreach efforts at local schools and youth centers. Faculty said the new program – especially the two Spanish-only courses – would increase students’ comfort with speaking the language, making it more likely they will graduate speaking fluent Spanish. Dolores Perillan, a teaching instructor in Spanish, said serving the community is an experience students often need to become bilingual because they are put in situations that the classroom can’t always replicate. Allison Caras, an assistant professor of Spanish who will teach Spanish Applied Linguistics, said the new major would help students improve verbal language skills that may have been lacking in the past. “This University is a very global university, so if you have students who don’t speak a foreign language or use it out there, then what does ‘global’ mean?” Caras said. Paul Wahlbeck, the vice dean for programs and research in the Columbian College of Arts and Sciences, said departments are ultimately responsible for the amount and type of courses they offer, a decision made based on student interest. “Course offerings are continually reviewed by department chairs to provide the best, most engaging courses possible for our students,” Wahlbeck said in an email. Students said a focus on service learning could help further develop their language skills by providing more opportunities to speak their target language. 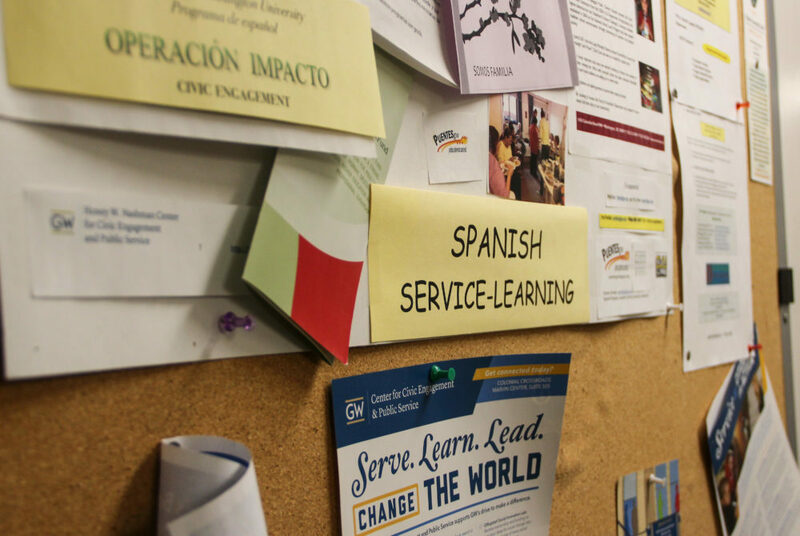 Clare O’Connor, a freshman in the Elliott School who intends to minor in Spanish, works every Monday at Operación Impacto, a student organization that tutors youth at the D.C. Bilingual Public Charter School. The new program will allow her to work at the school for credit toward her degree. O’Connor said there’s not enough focus in the Spanish program on actually speaking the language in class, one of her chief complaints about the department. This fall, the Department of Romance, German and Slavic Languages and Literatures – which includes the Spanish program – began teaching some courses in English, with an optional foreign language component. The move came after the department was forced to cancel several classes last year due to a shortage of professors. Morgan Camp contributed to reporting.